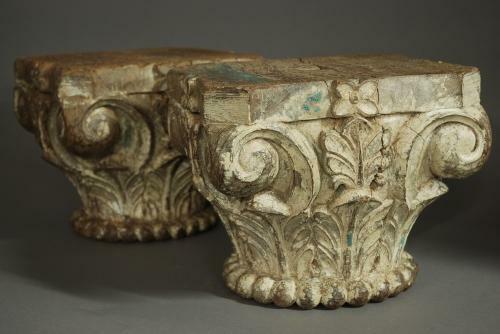 These nicely carved capitals consist of scrolling designs with foliage decoration and carved ball decoration to the base. Some years ago they have been painted with white paint, there is also evidence of blue paint. They are very decorative items and could be used as stands, please note the vases are for photographic reasons only and are not included in this price. These capitals are in good condition.